Whether you're ready or not, Christmas is upon us. Here are some solutions we'd recommend to keep those expenses in check. We all know it's nice to come out of the cold to a nice warm house, but it will push up your gas bill, and you'll pay for it soon. Wear long johns or a vest under your clothes; put a jumper on over the top. Make yourself a cup of tea or hot chocolate instead of an orange juice. Light a couple of candles. Snuggle under a blanket while you're watching the Christmas specials. Turning down your thermostat by just a few degrees makes a lot of difference over the dark months; you'll be surprised how much you'll save. Make a list. Decorations, presents, even Christmas dinner. Make a day of it. Write down everything you need and organise your shopping trip by distance and priority for all the shops you want to hit. Making fewer trips means you'll spend less on travelling, and you might be able to pick up some bulk buy savings. 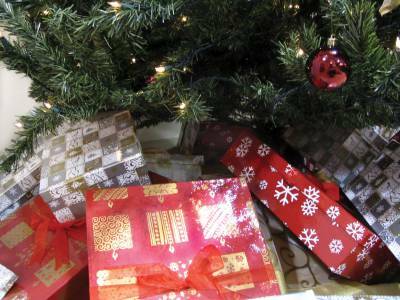 A good strategy for next year would be to buy some of the gifts throughout the year, when you see them on sale, and store them until Christmas comes around. Jackets, for example, are cheapest in the Spring. And swim suits are cheapest in Autumn. Toys and games are most expensive at Christmas, for most of the year you can get much better deals. You can bake cookies or cakes for someone, and write their initials on them with icing. If you're good with any sort of craft, like woodwork or knitting, think of someone on your Christmas list who would appreciate a homemade gift. You can also make your own Christmas cards. People will appreciate the personal touch and you'll be saving money. The best gifts are not the most expensive ones; they are the most thoughtful ones. Maybe Auntie May would like a soup mix she just needs to add water to. Get some dried vegetables, dried noodles and some seasonings, mix it together in a tub and wrap it up with a ribbon. It's a great gift at very little cost and it'll last half the year. Wrap up some teabags, a pair of teacups, and a packet of choc-y biscuits and you've got a Night-In Kit! If your Dad is into cars, get him a trial subscription to a car magazine. Lots of publishers will offer special deals for new subscribers; it might end up cheaper than a book. Originality is often more impressive than price tags, have a think and maybe you'll come up with a great present you don't have to sell your home to buy. Amazon is the world's largest online retailer, and they have a massive selection of items for sale, including popular gifts like books, video games, DVDs and music. However, Money Dashboard's new price beater allows you to get an Amazon discount on almost any item. Simply find the item you want on Amazon UK, copy and paste the link into the text box on our price beater, and within 48 hours we will contact you with our best offer. Okay, Christmas cards are pretty cheap, but especially if you've got a lot of friends around the world, or family abroad, postage costs can multiply. Maybe the eldest generation in your family don't use email, so send them a nice card from the post office. For everyone else, send e-cards and pocket the extra cash. Check out online which supermarkets are offering special deals on Christmas food. If you're cooking for a lot of people, it can be advantageous to look for which shop is offering the best deals on quality food. Especially if you are buying in bulk. Food is a big deal for a family Christmas. What's the best way to keep it both healthy and frugal? Simple: Soup. A soup starter can be prepared on mass, and feed a large family for only a few quid. And a bowl of piping hot soup will be great to combat that winter chill. This can be done with your office, your friends, your family, your bowling team, anyone. Everyone puts their name into a hat, and then everyone picks a name out. Make sure they put it back if they get themselves. Then you buy a present for the person whose name you get and no one else. That way everyone only has to buy one present, and everyone only gets a present. You could even set a spending limit to make sure everyone buys similarly priced gifts. You can choose to keep it anonymous, with everyone putting their present on a table or under the tree with the recipient's name on it, or you can let them know it's from you on Christmas day.